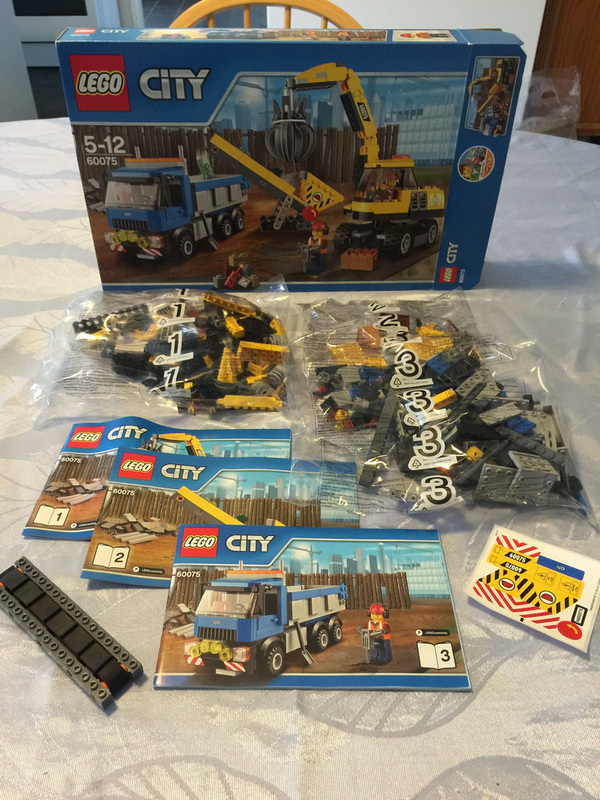 I have finally collected all of the 2015 construction sets. This one was the last one on the list for me, and it’s a beauty. The set itself actually has a few firsts in it where LEGO Construction is concerned. 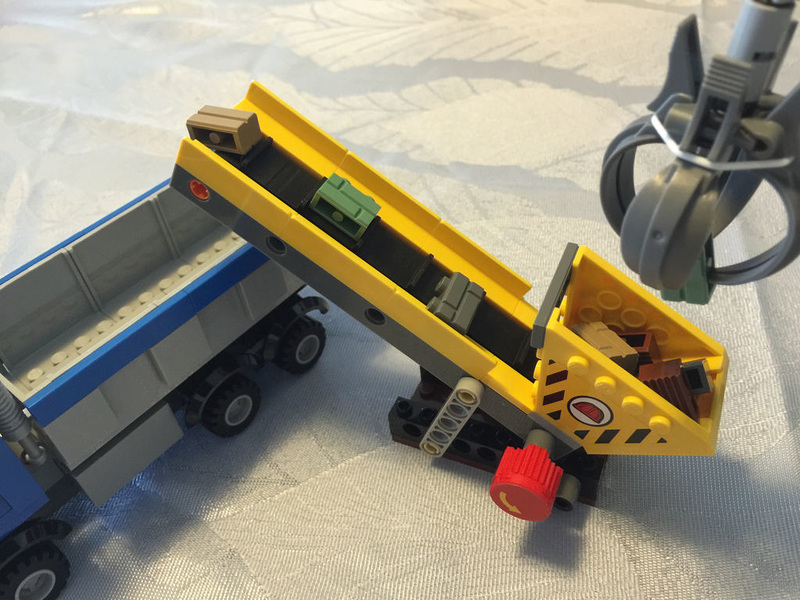 It’s the first set to have a grabbing crane, a conveyor belt, and the first construction set to include a vehicle that is not in yellow and black. I think the designer of this set was a Classic Space fan, with the blue and grey truck. It screams space! In the box you’ll find three parts bags, a loose conveyor belt, three instruction manuals, and a sticker sheet with 12 stickers. There are a few interesting parts in this set, the main one of course being the claw assembly of the crane. The four claw parts are great, as well as the Technic pin connector with four claw grips. They are held together with an elastic band that gives it a spring return. The claws are very rare, with this colour being unique. It’s only been seen in another set in black – 7596: Trash Compactor Escape from the Toy Story theme. There is also the end piece for truck body, which is new in this colour. Again, this has only been seen before in bright orange for 60083: Snowplough Truck. 2015 saw the introduction of a new 2×4 wheelbase component called the Bearing Element 2×4 Mini Snap. It’s a new way LEGO wants us to add wheels to vehicles, and I’m guessing we’ll see more of them in the future. 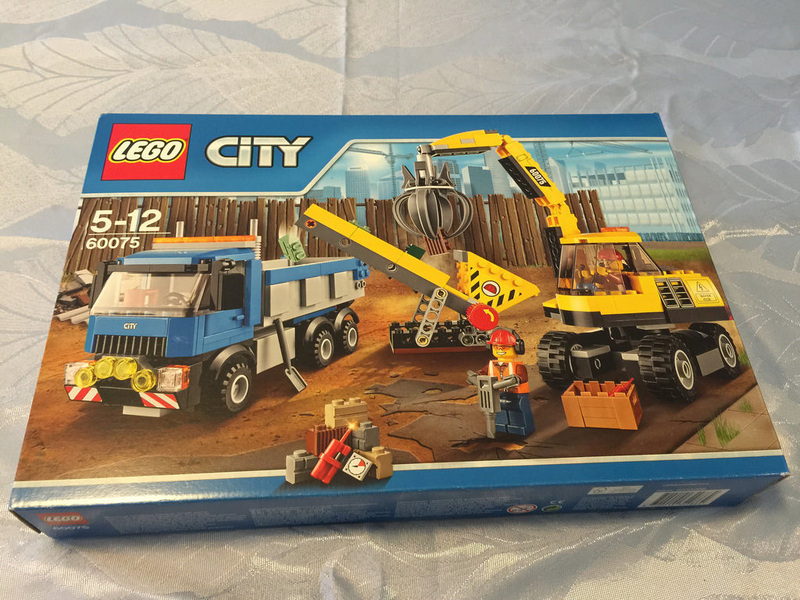 Other great parts include the grey truck side walls, the plate with wall 4x3x3, and four more elements that are very hard to come by – the 1×1 flat transparent tile, the 1×2 profile brick in sand green, the 2x6x2 plate with 4 vertical studs, and the 1×2 hinge plate, both in bright blue. Of course, there’s also the conveyor belt. While it isn’t rare, it’s only been seen in 6 sets since 2011. Finally, we come to our two minifigures. Both are male blue collar workers. Both have eye protection, and one has high vis work wear, and the other in a maroon checked shirt. Once again, there is the new piece of headgear – the red helmet with ear protection built in that we’ve seen with all the construction sets from this year. These guys come with a lot of accessories – they’re clearly ready to work! Sorry, no photo this time of the minifigures! Check the Flickr album for some though. Pretty standard spares in this lot. 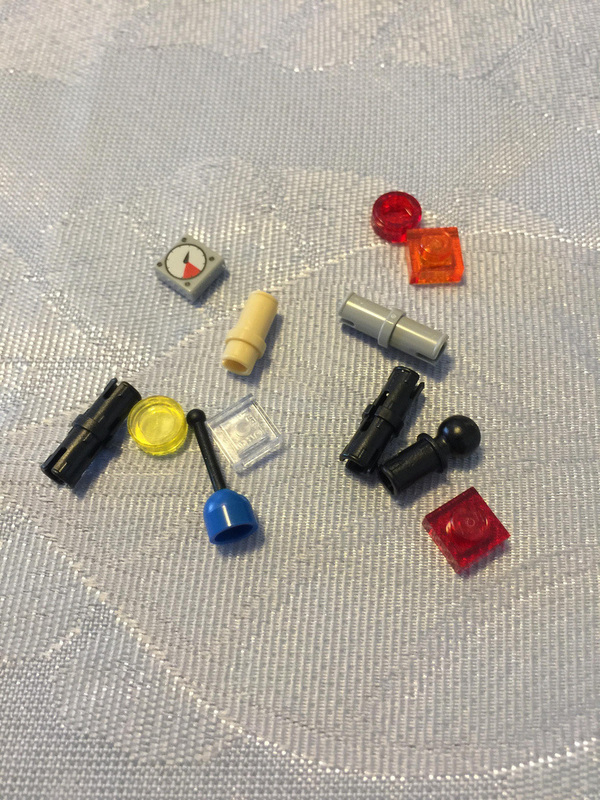 A few notable items would probably include a transparent white 1×1 tile, a ball with friction snap, and a printed timer 1×1 tile. First off, the Space Truck (sorry, I couldn’t resist). It’s a pretty nice tip truck, with a great looking bed and tailgate. I particularly like the front of it, with it’s four yellow spotlights. 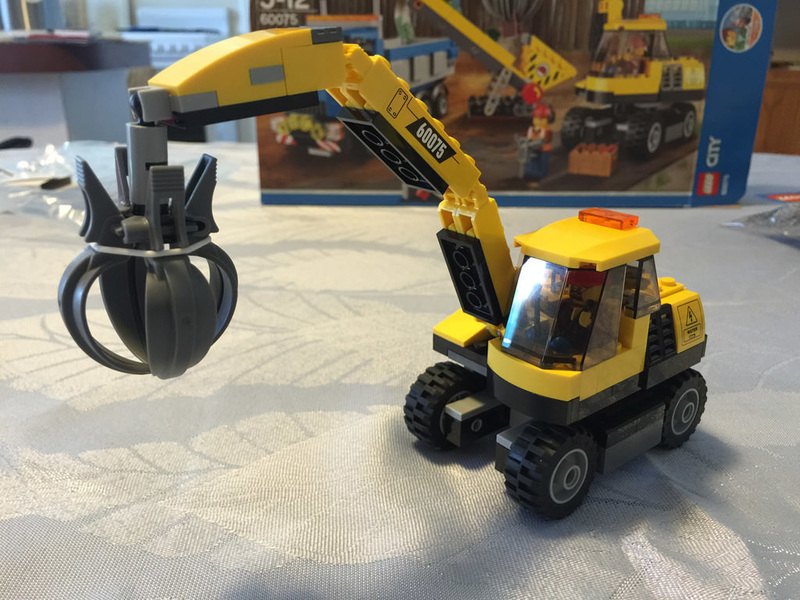 The excavator is small, but it looks pretty rugged. It’s most likely the centre attraction for the set. The boom is nice and tight, and the claw makes for a very unique vehicle. Finally, the conveyor belt. It works very well, and is nice and tight to turn, but if the angle is too high, the bricks won’t keep going up. 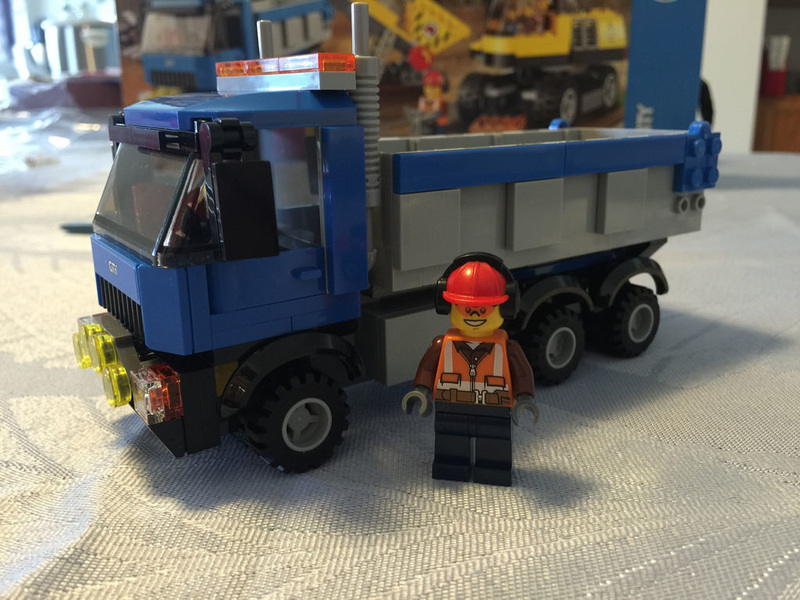 All in all, it’s a great set to round out the construction sub-theme for 2015. 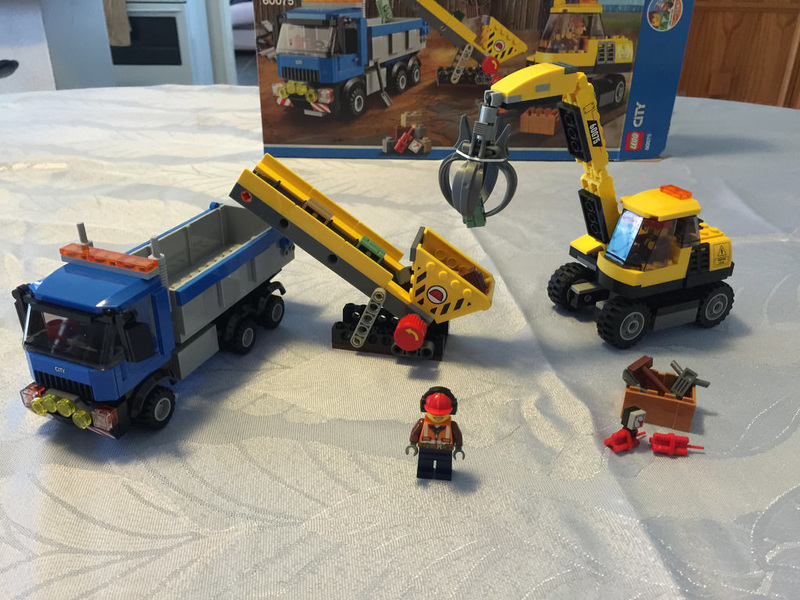 It has some great play features, and looks great, especially with the rest of the construction sets. This set gets 9.5 out of 10 sand green profile bricks. A matching colour truck would have been just perfect. Next up to review is 21108: Ghostbusters Ecto-1 from LEGO Ideas!